Successfully Added Folding LED Desk Lamp with Calendar and Alarm Clock to your Shopping Cart. 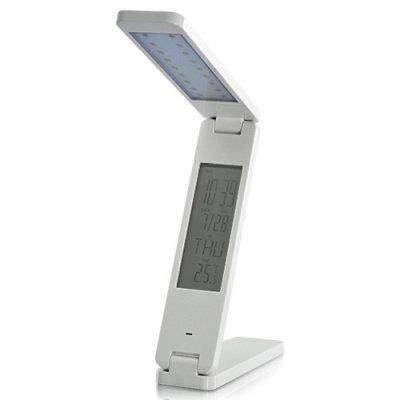 Folding LED Desk Lamp with Calendar and Alarm Clock: a stylish and multifunctional bright light! This beautiful LED desk lamp has been designed with 18 LEDs and 3 foldable segments for maximum lighting efficiency and convenience. Easily adjust the lighting intensity and angle by choosing 1 of the 2 lighting modes available and moving each single segment to desired position. Then, just place this modern lamp on your desk, night table and even on walls for a convenient and powerful LED light! A mount with sticky tape is also provided to hang it up, which will help you save space or just make your room more fashionable. The smart LED book lamp is totally safe for your eyes. No harmful material, no UV, no infrared ray. The emitted light won't strain your eyes, which is essential for those who like spending countless hours reading novels, comic books and magazines or watching photo albums. Moreover the bulbs don't heat allowing you to move the lamp without burning your hands. Let your kids use this harmless light - even under their bed - with total peace of mind! Offering both convenience and safety, this LED lamp is also economical and long-lasting. Thanks to a higher light efficiency than common bulbs, it will reduce the fee on your power bill. Save money and make the environment greener! About performance, after being fully charged, it can illuminate during 10 continuous hours, which means a whole night. What more? This LED lamp is also a calendar, thermometer, clock and alarm: all this information is displayed on the large screen located in the middle segment. This Folding LED Desk Lamp is the perfect pal for your home and office by providing safe, discreet, bright and efficient white light. It is in stock right now and brought to you at an unbeatable price by the online leader of electronic gadgets, Chinavasion. Light but also calendar, thermometer, clock and alarm!